Tickets available here beginning 3/15 at 9 a.m. The Arts Council is pleased to present this piano/cello duo during their USA tour. They have performed to rave reviews in their native Portugal and elsewhere on the Continent. As you have no doubt guessed, they are brothers, twins in fact! Luis began studying piano at age 8 and like his brother, appears as a soloist with orchestras and as a chamber musician, with Fernando as well as other ensembles. He has received many awards and prizes, and has performed throughout the Continent as well as Africa and South America. He has recorded for Portuguese National Television RTP, for Antena 2 Radio, CHIN Radio and NBC Television. Fernando and Luis have prepared a fascinating program, both from a musical aspect as well as historical perspective: they will play works by Robert Schumann, Clara Schumann and Johannes Brahms. You may be aware of the mystery surrounding the relationship among these three composers and friends; while speculation abounded during their lifetimes (and still abounds) we do know that each influenced the other’s compositions. This young, dynamic duo comes recommended by Carles & Sofia, duo pianists from Spain, who delighted the Kiawah audience during the 2016-2017 season. Carles & Sofia acknowledge that these young musicians are not yet well known in the US, but believe they will shortly make an impact across the globe. 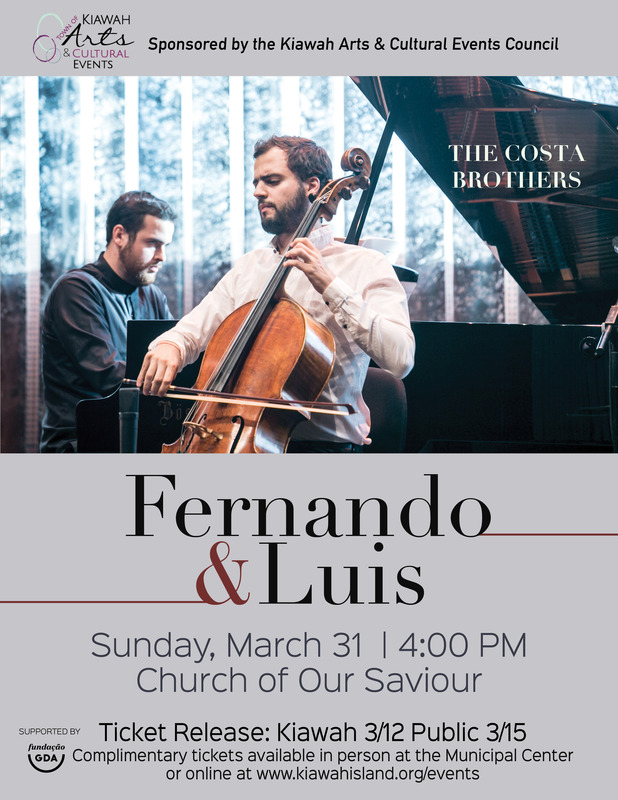 Don’t miss this chance to hear the Costa Brothers! Click here to read an article about the Schumanns and Brahms. Listen to Fernando and Luis play a cello sonata by Brahms.